When I Alt+Tab from Chromium to LibreOffice, LibreOffice stays transparent, but is actually focused. abyomi0 raised the priority of this task from to Normal. abyomi0 assigned this task to zmike. abyomi0 added a project: enlightenment-git. abyomi0 changed the visibility from "All Users" to "Public (No Login Required)". abyomi0 added a subscriber: abyomi0. This also seems to happen even if Composite-Focus Out Color is off. It only appears to affect composite focus color out, but whatever this is makes the glitch more noticeable. Is there a setting somewhere that I've overlooked? This seems to have become slightly different. I'll elaborate when I get the chance. You need about 4 windows open to reproduce it. 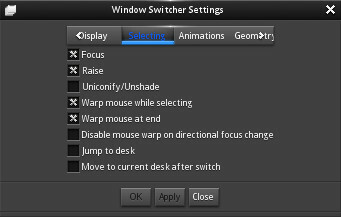 This seems to be related to the options for window switching. 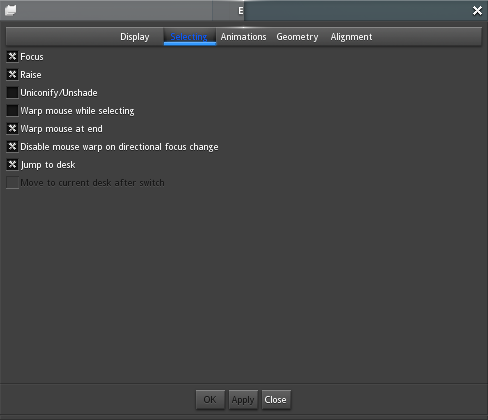 If I have both Warp mouse while selecting and Warp mouse at end, then I run into the issue as shown in the recording up above. I don't know why both were set...perhaps there should be a warning when both options are enabled? 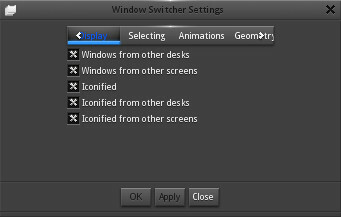 "If both of these options for Selecting are enabled at the same time, window switching will be broken for until one of the options is disabled. Do not report a bug." I think it might have something to do with Warp mouse while selecting...because (as of now) with it off, I don't see this. This is probably fixed as of yesterday. It would seem so. Thanks.